An improved technical structure sees enriched agronomical inputs improve the colour, size and quality of lemons as the season starts in Maswiri. As the Jupiter Group moves through April they will begin to pack Star Ruby Grapefruit, much later than in previous years, as they have decided to minimize the aggressive process of de-greening (high temperature, humidity and ethylene gas). Jupiter South Africa's farm in the Western Cape, Zonquasdrift, has started picking satsumas this week too. 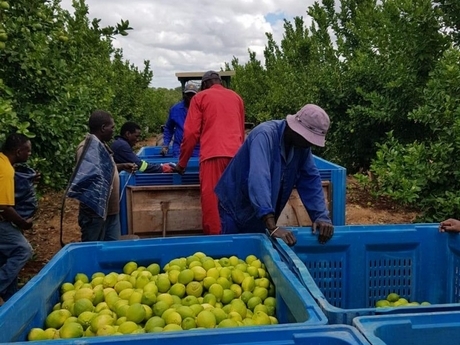 It will be the last time fruit from the farm in Limpopo, Maswiri, will be packed in the 40-year-old pack house, affectionately known as the “old lady”, as work begins to upgrade the facilities. May will see the arrival of a brand new Greefa electronic sizer and MED pack line components which will be used to pack Valencia oranges. Packing using the new lines will commence as early as June. Technical Director Cristian Mertzger said: “By the end of the year, the entirety of the old pack house will be gone and we will be in a better position to meet the demand of our markets specifications.